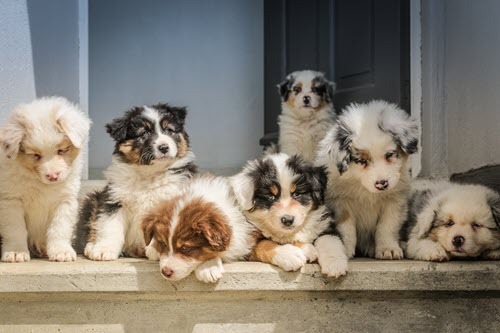 What if you had to take care of all these cute pups? What is Credit Card Care vs Insurance? Users of everyday credit cards will recognize that said cards are used for expenses that occur as they happen. Insurance is pre-paid (usually a monthly payment) against a point in time when the need occurs. It’s a way to pay for the costs of many treatments and procedures and allows you to make convenient monthly payments. CareCredit is accepted at over 200,000 providers nationwide for LASIK and Vision Care, Cosmetic and Dermatology Procedures, Dentistry, Veterinary, Hearing Care and other specialties. Our Reduced APR special financing options of 24, 36, 48 and 60 months are for larger purchase amounts ($1,000 or more for our 24, 36 and 48 month options with a 14.9% APR, and $2,500 or more for our 60 month plan with a 16.9% APR), letting you make monthly payments with a reduced, interest rate over the duration of your promotional period. Full Circle Veterinary Care is an authorized provider for CareCredit and accepts their card for veterinary expenses you incur at our clinic.You can also apply for CareCredit in person at our offices. We have brochures for you. A credit decision is almost instant. You can find out more about the CareCredit card online, apply for the card and read FAQ’s and testimonials from users. Let us move on to actual insurance providers for the comparison. Trupanion offers more than traditional pet insurance Trupanion was created to help your four-legged family members get the care they need when they’re sick or injured. When your pet is unwell, the last thing you want to think about is the cost of medical care. Insurance will help take care of that financial burden so you can focus on getting your pet quality veterinary care. When it comes to cats and dogs, they deserve a lifetime of nothing but the best. Our love of cats and dogs is why we provide comprehensive coverage for pets and strive to offer an exceptional insurance experience for pet owners. We can approve and pay bills directly to select veterinary hospitals within minutes, our customer care team is available to assist 24/7, and we have trained veterinary professionals working throughout our company to help us better understand the medical issues pets face. Because of these unique offerings, we consider ourself a step above traditional pet insurance and prefer to be known as medical insurance for cats and dogs. No matter what you choose to call us, rest assured that our policy has what it takes to help protect your pet. You can view these graphics on the Trupanion site. It is pretty straight-forward. You make a claim and they pay 90% of the eligible expenses. You can see what is eligible in the “What’s covered” column. Knowing “Whats not covered” is also key. Exam fees, wellness and preventive care and pre-existing conditions are not covered. It is important to know that a pre-existing condition is defined as an illness or condition which occurred or showed symptoms prior to your pet’s coverage effective date. So your pet insurance coverage will not be excluded for what might be a hereditary trait in the animal, unless the symptoms are already showing for that trait. That is the 6 million dollar question. As you can see clearly see in the chart, without a deductible, our 6 year old male cat is going to cost just over $130 per month or $1566.36 per year to insure. Oliver as a 1 year old cat is much less expensive to start – $79.65 per month or $955.80 per year with no deductible. Oliver (or Olivia) as a 6 year old female cat is less per month – $118.77/mo ($1425.24/yr) vs $130.53/mo (1566.36/yr) for her male counterpart. 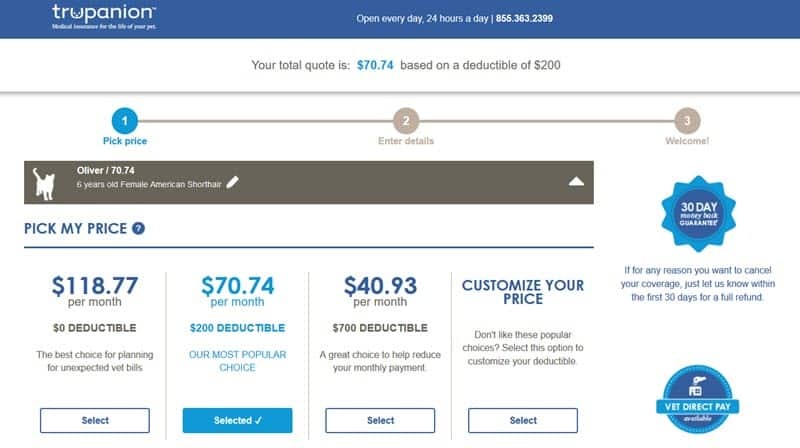 If you choose to pay a $200 deductible, you can knock off the better part of $50 on the premiums. Which many choose to do, judging by the “Our Most Popular Choice” tag. This gives you a hint of the rates for pet insurance. Obviously there are other variables to consider which we could not cover, like differences between individual breeds and pets with hereditary or pre-existing conditions. To wrap up our series in Part 3, we are going to look at two more pet insurers – Healthy Paws and Figo. FCVC hopes you find this pet insurance series useful for making a decision whether pet insurance is right for you, your pet and your lifestyle.